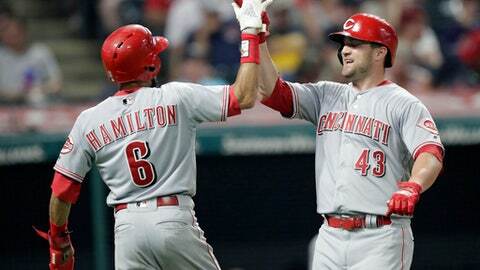 CLEVELAND (AP) Anthony DeSclafani gave the Cincinnati Reds seven strong innings Monday night. DeSclafani (4-1) allowed one run and Scott Schebler was 4 for 5 with a homer for Cincinnati, which took the opener of the team’s annual battle for the Ohio Cup and sent the AL Central leaders to their third straight loss. Francisco Lindor’s sacrifice fly and Michael Brantley’s RBI double made it a two-run game, but Iglesias struck out All-Star Jose Ramirez on three pitches for his 18th save. ”I’d rather not be down six, but if you can get the tying run to the plate, especially with Jose hitting, you give yourself a chance,” Indians manager Terry Francona said. DeSclafani (4-1) held the Indians to five hits. Yonder Alonso’s solo homer broke Cleveland’s 17-inning scoreless streak in the fourth. Votto hit a fifth-inning home run off Mike Clevinger (7-4), who matched a career high with 11 strikeouts in six-plus innings. Cleveland’s right-hander allowed five runs and needed two outstanding defensive plays to keep the Indians in the game. Tucker Barnhart’s RBI double put Cincinnati ahead in the second. Jesse Winker had an RBI double in the fourth that was followed by Barnhart’s run-scoring single. Schebler singled on the game’s first pitch, but was nearly picked off with Jose Peraza batting. Schebler went back to the bag standing up on Clevinger’s pickoff throw and was called out by James Hoye. The Reds challenged the play and the call was overturned. Barnhart’s double scored Eugenio Suarez, who drew a leadoff walk in the second. Greg Allen crashed into the center field wall while making a leaping catch of Adam Duvall’s drive. Gennett, the Reds’ All-Star second baseman, turned in a highlight-reel play in the third after Ramirez’s hard grounder glanced off Votto’s glove. Gennett went to shallow right field to back up the play, stopped, turned around to make a diving barehand grab and threw Ramirez out from his knees. Josh Tomlin’s rocky season continued when he gave up Schebler’s two-run homer in the ninth. Tomlin has allowed 21 homers in 49 innings this season.